Figuring that out can be costly and difficult for scientists racing to contain a highly contagious disease, but an innovative, newly-patented test that needs only a drop of blood and a silicon chip offers hope for speeding up the process. And its inventor thinks his device, which may be on the market as early as next year, could be useful for detecting other diseases, too. “What really excites me is having this tool that people come up to me with exciting applications that I haven’t thought of — that really is neat to me,” says Benjamin Miller, a dermatologist at the University of Rochester in New York. Miller’s patent is for flu applications of his tool, called Arrayed Imaging Reflectometry. 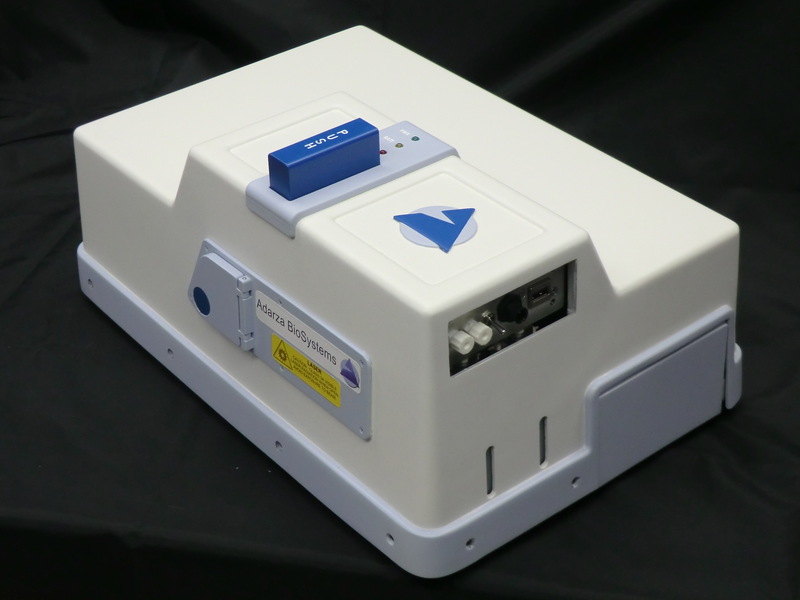 The AIR platform uses a light-based technology to detect small target molecules. The conventional way to detect molecules is with a labeling system, which marks the target with a protein to stand out. By contrast, label-free systems like AIR suppress the background signal to make the target visible, which requires fewer steps and can minimize errors. The concept is similar to looking at the windows of a building, Miller explains. In daylight, it’s almost impossible to see inside, but at night, the ambient light disappears and the dark sky allows you to see into the lit windows. The detection process takes place on a silicon chip about the size of a pencil eraser with a coating that absorbs incoming light. Let’s say a scientist places a flu molecule in the coating and then adds a drop of vaccine onto the chip. If flu-killing antibodies from the vaccine bind to molecules on the flu virus, the tiny difference in reflected light will alert the scientist that the vaccine works successfully. A testing plate that holds 96 such chips can be inserted into the chip reader and studied simultaneously. Since each chip can detect 200 different molecules, it makes conducting multiple experiments very efficient for research labs. It’s also relatively inexpensive. The raw materials for each test plate, like the silicon chips, are under $10. The machine that reads the test plates costs around $50,000, which Miller says is comparable to AIR’s primary competitors, Luminex and Mesoscale Design. An experiment conducted using AIR also involves fewer steps compared to older techniques used to detect target molecules, such as enzyme-linked immunosorbent assays. AIR has a similar timeframe of about 90 minutes from start to finish, and it also provides equally-sensitive results. “One key advantage is that you can potentially do hundreds of experiments at once which enables it to be a cost-effective and convenient technology,” says Judith Su, an optics researcher at the University of Arizona, who was not involved with the research. Miller and his colleagues used AIR to test 10 mallard ducks last year and found the platform created an accurate profile of the different strains of flu the birds had been exposed to. The team hopes to expand this into a larger study soon, even as it begins to roll out the product commercially. AIR will be manufactured and marketed by Adarza Biosystems, which bought the rights to the technology from the University of Rochester. Adarza plans to begin selling the platform to research labs in 2017, but hasn’t disclosed the final price yet. Miller hopes the technology will soon be used for research in clinical settings and eventually by individual customers. Maybe people could carry out blood tests on their own, examine air-quality or screen food products. These are some of Miller’s ideas for later down the road. Not everyone is sure the product will best its competitors in the field of particle identification. The AIR device might be hard to use because it requires light to enter the chip reader at a precise angle and because performing these tests in a liquid environment is preferable to the rinse and dry method AIR uses, notes Selim Unlu, an engineer at Boston University who was not involved with the research. “Those are the major issues I see,” he says. Miller’s team, however, has already used AIR to detect different blood-based proteins. Flu research is a fitting next step, he says. “This puts a new tool in researchers’ hands that will help to give us a better understanding of how flu viruses circulate in the wild, and it will provide better information about how to develop new and more effective vaccines,” Miller says. Although Miller’s patent pertains only to flu detection and research, he believes the platform’s underlying technology can facilitate a host of applications, from diagnosing various diseases to monitoring agricultural products.